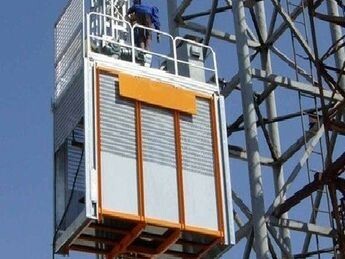 We provide Construction Hoist Elevator of all sizes and capacities to clients for a variety of applications. We offer turnkey services for installation, dismantle, operator training, on-site standby technicians, and preventative maintenance. Our experienced hands-on sales managers will visit your job site to discuss all your elevator options. 1. Construction hoists for lifting people and materials, used in all types of applications. 2. The standard range of construction hoists offer the optimum transport solution for low rise, medium and high rise buildings. 3. Typical applications include new build construction, refurbishment, chimney, offshore and bridge construction. 4. The construction hoist can be used in single or double cage configurations. Also be equipped with a frequency control unit. We have 5 series products: Tower crane , roof crane, construction hoist , construction gondola, gantry cranes etcs, products are mainly export. Our products are exported to the United States, Russia, Brazil, Vietnam, Philippines, Malaysia, India, Pakistan, United Arab Emirates, Kuwait, Saudi Arabia , Bahrain, Chile,Iran, Columbia, Venezuela, Algeria, Kazakhstan More than 20 countries and most domestic provinces .